A hypervelocity dust accelerator for studying micrometeorite impacts has been constructed at the Colorado Center for Lunar Dust and Atmospheric Studies (CCLDAS) at the University of Colorado. Based on the Max-Planck-Institüt für Kernphysik (MPI-K) accelerator, this accelerator is capable of emitting single particles of a specific mass and velocity selected by the user. 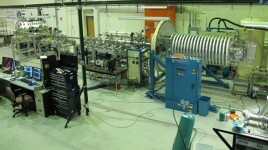 The accelerator consists of a 3 MV Pelletron generator with a dust source, four image charge pickup detectors, and two interchangeable target chambers: a large high-vacuum test bed and an ultra-high vacuum impact study chamber. The large test bed is a 1.2 m diameter, 1.5 m long cylindrical vacuum chamber capable of pressures as low as 10−7 torr while the ultra-high vacuum chamber is a 0.75 m diameter, 1.1 m long chamber capable of pressures as low as 10−10 torr. Using iron dust of up to 2 microns in diameter, final velocities have been measured up to 52 km/s. The spread of the dust particles and the effect of electrostatic focusing have been measured using a long exposure CCD and a quartz target. Furthermore, a new technique of particle selection is being developed using real time digital filtering techniques. Signals are digitized and then cross-correlated with a shaped filter, resulting in a suppressed noise floor. Improvements over the MPI-K design, which include a higher operating voltage and digital filtering for detection, increase the available parameter space of dust emitted by the accelerator. The CCLDAS dust facility is a user facility open to the scientific community to assist with instrument calibrations and experiments. A full review of the scientific instrument was recently published in the American Institute of Physics. All the CCLDAS facilities are available for use by scientists and students from other institutions.